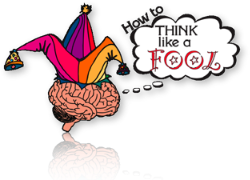 While sharing similarities with doing the opposite, trying a bad idea, and breaking the rules, doing the wrong thing lets fools break free from the constraints of culturally dictated proper behavior by pretending to be ignorant of etiquette. They act improperly to thwart authority and maybe even authoritarianism. In his book Clowns, John Towsen describes the medieval practice of "...the Feast of Fools, a New Year's celebration where the minor clergy were allowed to usurp the functions of their superiors and engage in a wide range of blasphemous yet officially approved clowning." Everything gets turned upside down with reverent mockery. You can get so caught up in being perfect, succeeding at all costs, and knowing you are right, that you effecively block yourself from creative solutions. Imagining and listing the wrong things to do in a situation frees you up to question whether they are truly incorrect or just what the daffy doctor ordered. You are expected to eat with knife and fork at a steakhouse, but at an Ethopian restaurant, you eat with your hands. Think: What's the right thing to do? What's the wrong thing to do? How many ways can I act improperly here?